Vegecat™ has allowed cats to be vegan since 1986! Supply lasts a 10 lb. (4.5 kg) cat 11 weeks. Contains Dried Yeast for Flavor. *PLEASE READ about arachidonic acid HERE. Sources of arachidoinc acid discussed below. Suggested Use: Our recipes list the amount of supplement required for that recipe. You may increase or decrease the amount of food you prepare by proportionally increasing or decreasing all ingredients in the recipe. Your cat’s weight determines how much he or she eats, and our recipes have the correct proportions to meet the nutritional requirements for a cat of any weight. It is best to mix the supplement into prepared warm food, but the supplement can also be added during the cooking process. Feed your cat freshly prepared food for superior health! Use ingredients you trust without using animal products. While cats are carnivores, their nutritional needs can be met by a properly supplemented plant-based diet. 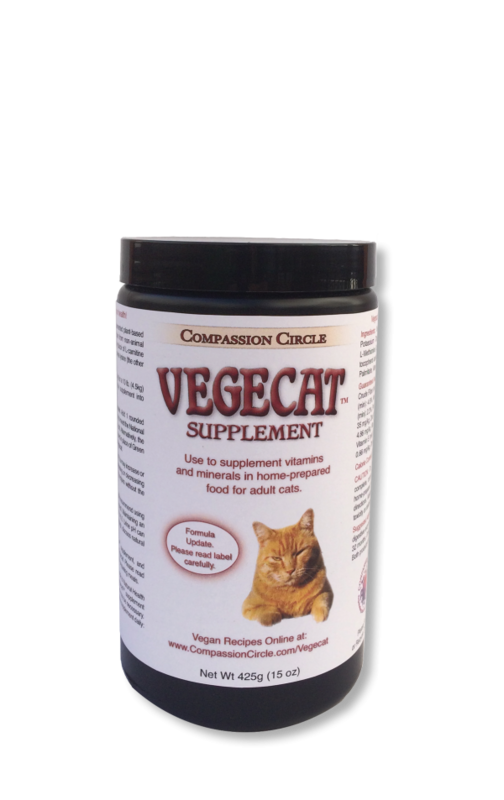 The Vegecat™ supplement provides the nutrients cats require from non-animal sources, including: taurine, vitamin D2, vitamin A, and a building block of L-carnitine (methionine). Vegecat™ recipes are carefully formulated to provide lysine (the other building block of L-carnitine), ample protein, essential fatty acids in the correct ratio, and all else necessary for a healthy cat. We do not recommend adjusting recipes without consulting an animal nutritionist. Vegecat™ no longer supplies the essential fatty acid arachidonate. Add 1 rounded teaspoon of Compassion Circle’s Green Mush™ (4g) to the diet per day to meet the National Research Council (NRC) recommended amount of arachidonic acid. Alternatively, add 1 compressed teaspoon of Chlorella Manna™ (2.25g), or another chlorella vulgaris product. One rounded teaspoon of powdered (ascophyllum nodosum) kelp (4g) can be used in place of Green Mush or chlorella vulgaris. All recipes include food yeast. We highly recommend using our VegeYeast, a brewer’s yeast modified for acidity. The ideal urine pH for a cat is 6.0 to 6.5. Urine pH can be tested at home or at a veterinarian’s office. Wet food is best for the urinary health of cats. If you primarily feed dry kibble, it is best to add moisture to the diet. Pureed vegetables add moisture and additional vitamins and minerals. Veggies should be no more than 10% of the diet to ensure the protein requirement is met. Please see the recipe instructions for more information. The Vegecat™ recipe brochure accompanies the Vegecat™ supplement, and recipes are available online at www.CompassionCircle.com/Vegecat. Please read the introductory portion of the recipe brochure thoroughly before preparing meals.